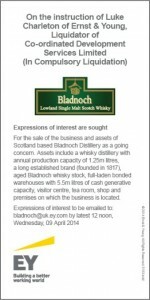 April 3, 2014 – As expected, the court-appointed administrator for Bladnoch Distillery plans to sell the Wigtown distillery as an ongoing business, and has started seeking expressions of interest from potential bidders. Luke Charleton of Ernst & Young was named as the administrator for Bladnoch last month after Colin Armstrong, one of the four investors in Bladnoch and the brother of managing director Raymond Armstrong, sought a court order to wind up the business. The Armstrong brothers were two of the four investors who acquired the closed distillery in 1994 and reopened it in 2000, but were at the center of a long-running family dispute on the distillery’s future. According to Raymond Armstrong, two of the investors wanted to sell, but no buyers could be found for a 50% stake in the company. A legal notice on Charleton’s behalf describes the Bladnoch assets as “a whisky distillery with annual production capacity of 1.25 million litres, a long established brand (founded in 1817), aged Bladnoch whisky stock, full-laden bonded warehouses with 5.5 million litres of cash generative capacity, visitor centre, tea room, shop, and premises.” Most of the distillery’s current income is generated by renting space in its maturation warehouses to other distillers, and limited amounts of Bladnoch’s Lowlands single malt have been available for sale since 2008. The notice asks for interested bidders to step forward by April 9. However, the notice does not specify whether the new owners will be able to run Bladnoch at full capacity. When the Raymond Armstrong-led investors bought Bladnoch in 1994 after it had been closed by UDV (now part of Diageo) the previous year, the contract specifically forbade the new owners from resuming whisky production. That restriction was later relaxed to allow around 100,000 liters of spirit production each year, and the distillery has been producing single malt stocks since 2000. However, production was stopped when the court ordered Bladnoch into administration, and all of the Bladnoch workers have been laid off until the distillery is sold. An Ernst & Young spokesman declined to comment Friday on whether the production cap would apply to a new owner, since the issue is still being reviewed by legal counsel. This story will be updated when more details are available. Editor’s note: This story was updated to include information provided by Ernst & Young.